The Bridget is a feminine reverie of pure white gerberas, sapphire irises and rich pink Asiatic lilies. Artistically arranged amid a subtle swirl of foliage, this boxed arrangement is a testament to the true elegance of flowers. This boxed arrangement is sumptuous and beautiful without being too bright and bold. The understated impact of this gift would suit a birthday celebration, would make a fantastic thank you gift, or be a brilliant Mother’s Day present. 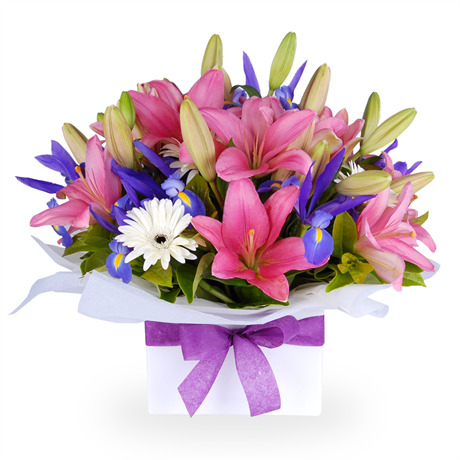 As the flowers are arranged in a gift box finished with violet ribbon, there is no need to arrange these stems in a vase, making the Bridget a low maintenance gift that shows care and class.